Merriell ("Snafu") Shelton grew up in rural Louisiana. He'd spent some of his early years in a Depression-era Civilian Conservation Corps camp. Snafu was Cajun and had a heavy accent. Before the war, he was a gambler. After the war, he married ("Miss Gladys"), had two sons (Floyd and Allen) and worked on air conditioners. He was in his early twenties, during the battles of Peleliu and Okinawa, and became a close buddy of Eugene ("Sledgehammer") Sledge. The photograph at the top of this page, from the papers of Dr. Sledge at Auburn University Libraries, depicts Snafu (on the left) in 1983. He is with Sledge (on the right) and Paul Wright (in the middle). Snafu and Sledge took turns sleeping - best they could - in their foxholes. They, like everyone else, had to be extremely quiet so as not to give away their position. When it was time to switch guard duty, the retiring Marine would quietly whisper his buddy's name to awaken him. One night, decades later, Jeanne Sledge wondered if she could wake-up her husband in the same manner. When she quietly whispered "Sledgehammer!" into his ear, he instantly awakened (move the video forward, to 8:19) - just like he did when it was Snafu who did the whispering. "Sledgehammer, what the h_ _ _ are you doin'?" Snafu asked in an exasperated tone. "Taking off my boondockers; my feet hurt," I replied. "Have you gone Asiatic [a term Marines used to describe someone overwhelmed by the fighting and not thinking clearly as a result]?" he asked excitedly. "What the h_ _ _ are you gonna do in your stockin' feet if the Nips come bustin' outa that jungle, or across this field? We may have to get outa this hole and haul tail if we're ordered to. They're probably gonna pull a banzai before daybreak, and how do you reckon you'll move around on this coral in your stockin's?" When I read "With the Old Breed" a few years back, it was difficult to wrap my mind around the idea that the Marine who committed and endured the savagery of the Pacific campaign was our neighbor, Mr. Merriell. But he was. He lived with his sweet wife, Miss Gladys, and his two sons in a little brick house on Highway 61, a mile or so away. He was an air conditioner repairman and installer ... His younger son and I played baseball together in the summer leagues. We'd see Snafu at the games, but he kept to himself. He was short and stocky, and had a hard, hard face. He smoked filterless cigarettes, I remember that, and that he loved to gamble. But mostly, he was this distant, mysterious man. . . .It was a revelation to me to read in Sledge's book what, exactly, the quiet, hard man who lived in the little brick house down the road had done early in his life ... He was our neighbor, but a loner. You never know about people, do you? He died a long time ago, as did Miss Gladys, and his older son Floyd, a talented teenage ballplayer who'd gotten mixed up in drugs. His younger son Allen -- my old playmate -- survives, I think, but I don't know where he moved off to. After Sledge published With the Old Breed, in 1981, he and Snafu reconnected. And ... when Snafu died - in 1993 - his old friend, Sledgehammer, was one of his pallbearers. Photo online, courtesy Eugene Sledge Collection, Auburn University Libraries. Shown here are Eugene B. Sledge (right) with Merriell A. "Snafu" Shelton (left) and Paul Wright (middle) at a 1st Marine Division reunion in 1983 in Milwauke, Wisconsin. All three men were Marine Corps combat infantrymen in World War II. They fought the Japanese in the Pacific at Peleliu and Okinawa with the 1st Marine Division. Sledge and Snafu were buddies in the mortar platoon of Company K, 3rd Battlion, 5th Regiment, 1st Marine Division. Sledge wrote a book about his combat experience called With The Old Breed at Peleliu and Okinawa. 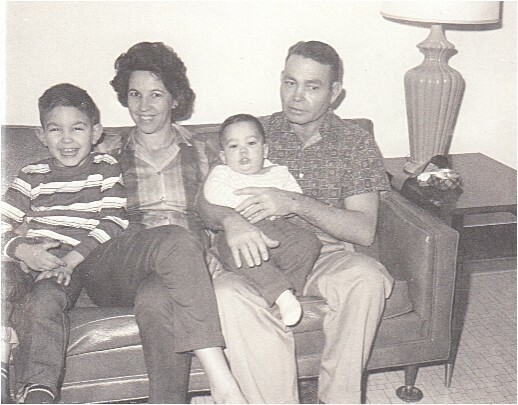 In-text photo of Merriell ("Snafu") Shelton with wife and two sons (Floyd and Allen), online courtesy Norwood Shelton via Find-A-Grave. Bos, Carole "Snafu Shelton - The Pacific" AwesomeStories.com. Oct 07, 2013. Apr 23, 2019.